The goal of Nova Blitz is to reduce your opponent’s Health to 0. You do this through a combination of playing Powers and attacking with Units. Both players start with 40 Health. Both decks get shuffled and both players draw 4 cards. Each player can mulligan once and replace all their cards with new ones if they don’t like the first draw. At the start of each turn, both players gain 1 Maximum Energy, refill their Energy and draw a card. Then there is an Action Phase followed by a Combat Phase. 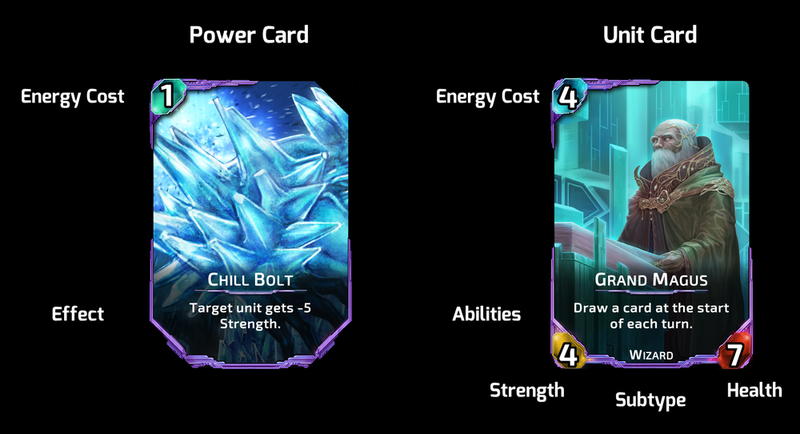 Every card in Nova Blitz has a type (Power or Unit) and an Aspect (Arcane, Tech, Divine, Nature, Chaos). The type governs how you play the card. The Aspect tells you which faction it belongs to. Power cards have a one-time effect, then go to your trash. Each Power has an Energy cost — you can only play the card if you have enough Energy. Unit cards stay in play in the arena to participate in combat turn after turn. They cost Energy just like Powers do, plus they have two additional stats: Strength and Health. Strength is how much damage the Unit deals in combat, and Health is how much damage is required to destroy it. Both players play cards in realtime during the Action Phase, which only lasts a few seconds. A shrinking bar shows how much time is left. To play a card, simply drag it from your hand into the arena. Playable cards are highlighted. Some cards need a specific target to be played on. For these, you need to drag the card onto the thing you want to aim it at. Valid targets are highlighted while you drag. You don’t have enough Energy to pay for it. There are no valid targets for it right now. You are at your maximum number of Units. Tip: Just because you can play a card doesn’t mean you should! The game highlights all legally-playable cards, even ones that would only hurt you at that moment. Any time you play or activate a card, you give up Initiative to your opponent, and vice versa. Whichever of you ends up with Initiative at the end of the Action Phase attacks first in the Combat Phase. Tip: Having Initiative is extremely important when both of you are close to 0 Health. Play quickly so you’re not stuck putting the last card out. 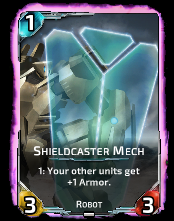 Some Units have abilities that cost Energy to activate. The Energy cost appears before the effect in the card’s text box, and the card glows purple if the ability is legal and you have enough Energy. To use an ability, just click the card. If the ability requires a target, it takes two clicks: first your Unit, then the target. In the Combat Phase, both players secretly assign combat orders to their Units. Each Unit can be assigned to either attack the opposing player (by dragging to their portrait) or block one enemy Unit in case it attacks you (by dragging to the Unit you want to defend against). Once both players finish assigning, combat commences. All Units belonging to the player with Initiative attack first, in the order their commands were given, then all the other player’s Units attack. If an attacking Unit is blocked, those two Units damage each other. Unblocked attackers damage the opposing player. Armor X: Each time this Unit suffers damage, Armor X prevents the first X points. Double Attack: If this Unit attacks and survives, it attacks again. Double Block: This Unit may block two different Units at the same time. Vanguard: This Unit may both attack and block at the same time. First Strike: When one Unit in a combat has First Strike and the other doesn’t, the one with First Strike deals damage first, and the other Unit only deals damage back if it survives. Overrun: If this Unit attacks and deals more combat damage than its blocker can survive, the excess is dealt to the opposing player. Regenerate: This Unit heals all damage at the end of each turn. Evade: This Unit ignores all effects of the next enemy Power or ability that affects it, but then loses Evade. Flying: This Unit cannot be blocked unless the blocker has Flying. Lifelink: When this Unit deals combat damage, you heal by the same amount. Frenzy: This Unit gets +1 Strength for each point of damage currently on it. Stun X: A Stunned Unit cannot attack, block, or use activated abilities for X turns. Can’t Attack X, Can’t Block X: If a number appears after these effects, they’ll wear off in that many turns. If there is no number, the effect lasts indefinitely. Summon: (some effect): This effect happens upon playing the Unit. Last Breath: (some effect): This effect happens upon the Unit dying. Attack: (some effect): This effect happens each time the Unit attacks. Block: (some effect): This effect happens each time the Unit actively blocks an attacker. Infiltrate: (some effect): This effect happens each time the Unit attacks and isn’t blocked. Initiative: (some effect): This effect applies while you have Initiative. Purify: Purifying a unit removes all its traits, abilities, and Strength and Health modifiers. “Strongest”, “Weakest”: These refer to the Unit with the highest or lowest Strength, respectively. Ties are broken by Health, and then if there’s still a tie, at random.